So having my vision for the lamp in my head, I headed to Lowe's and here's where my vision was derailed. 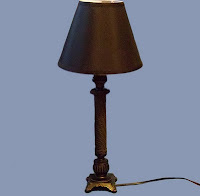 I found the lamp socket like I expected, but what I didn't expect was to have to pay five dollars for it and without the electrical cord. 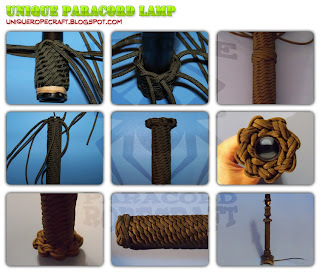 I was told by my dear mother while researching this project that you can purchase the whole lamp (electrical cord and all) from one of the local Dollar stores and it would be less than ten dollars. Since I was trying to maintain a budget on this project, I went with the Dollar store option and purchased the lamp and hood for less than ten dollars, had I went with Lowes it was sure to have cost twenty dollars or more for a lamp. One of my main objectives when deciding to create a project is not to spend as little as possible on cheap materials but to spend the least amount on the best materials. To tie this lamp I followed along with Grainger until I reached the halfway point, he used a Matthew Walker knot, I tied this and didn't like it so I removed it and kept going with the eight strand Crown knot. Also he started and ended with a Star knot, with the way the posts join together on my lamp I decided to only tie the Star knot on the top which would leave the ends showing on the bottom, I covered this with a 3Lx4B Turk's Head knot. For the upper section, it was pretty much the same as the lower section just smaller. The only thing different was since it was such a small section, another Star knot wouldn't look right so I tied an eight strand Crown knot with a 3Lx4B Turk's Head knot covering both ends. The Table Lamp project in Creative Ropecraft is a great weekend project. If you decide to try one I would only use the book as a reference and add your own touches to it because you know what knots you like and what will go with your individual lamp. This is the glorious part of knot tying, there is always another knot available, you just have to tie it. P.S. I know the final image is hard to see but I completed the project rather late and wanted to get it out there as soon as possible so I haven't had time to take a definitive image so that will be on the agenda for tomorrow. This is perfect for antique cabinets and houses. Very nice. Thank you and yes it would, especially if you used an old lamp or you can use techniques commonly found on the web to make a new lamp look old, either way it would look great.